A few days after we watched Sodbusters, my friend — my mate — and I were talking, and he couldn’t remember a particular word. Later that day, he came into the living room and exclaimed, “Ostrich.” Then he said the word he’d just remembered. Cracked me up. And so, until his death, “ostrich” replaced the phrase, “I remembered the word I couldn’t remember when we were talking before.” See how convenient “ostrich” is? One word in place of twelve. What a deal! I worried that making this private joke known would bring me unhappiness, but the opposite turned out to be true. At a lunch with a few friends, I told this ostrich story. During the same meal, we mentioned the football player who gave up his career and enlisted in the army, but no one could remember his name. Later that evening, I got a text: “Ostrich! Pat Tillman”. Made me smile. 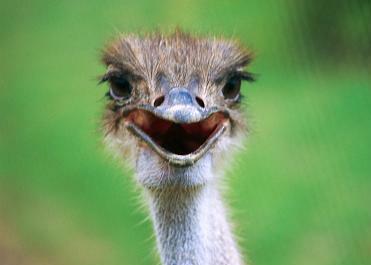 So, when you remember a word you couldn’t remember, remember to say — ostrich! I think I am going to adopt “Ostrich!” into my own vocabulary as well! Thank you! Isn’t it just the perfect word? I’m hoping more people spread the word! Hmm. I’ll have to think about that. Perfect, the way that one word can evoke so many pleasant memories and connections. Words do have power, even the wrong words–or forgotten words! My family has been saying “ostrich!” for the same reason for years! I’m glad to know we aren’t the only “crazy” people in the world! Oh, how utterly wonderful!! I am so thrilled that “ostrich” continues to live. Thank you for letting me know. You made my day. « Joylene Nowell Butler Likes DAUGHTER AM I!